There are two Fishers restaurants, one opened in Oxford in 1995 and the second in Clifton, Bristol, in 2001. The second location was the setting of our dinner on Saturday and 11 of us gathered to celebrate two birthdays. 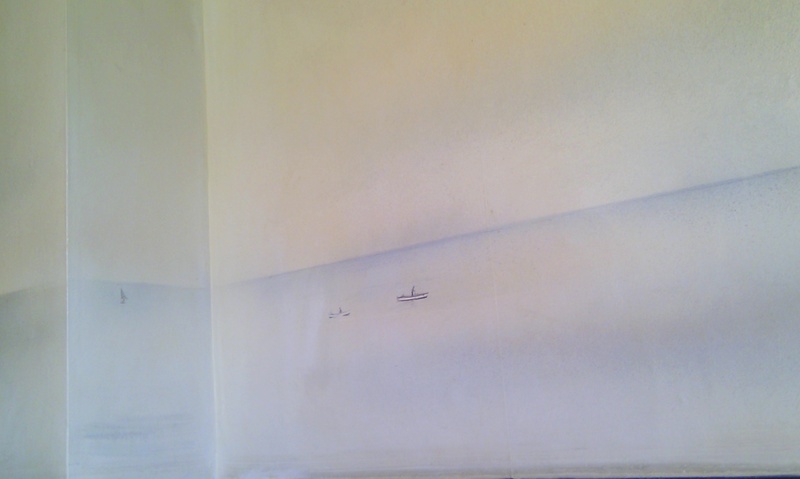 The restaurant interior is designed in a nautical theme: ventilator pipes, sails on the celings, ships lanterns – even the kitchen doors have portholes. The seafood theme is so consistent that it even surrounded the clientele from the walls. The dominance of seafood on the menu was not surprising but there were a couple of vegetarian dishes as well. The starters included a seafood soup, scallops, 0.5kg of mussels with white wine sauce, deep fried brie and oysters. 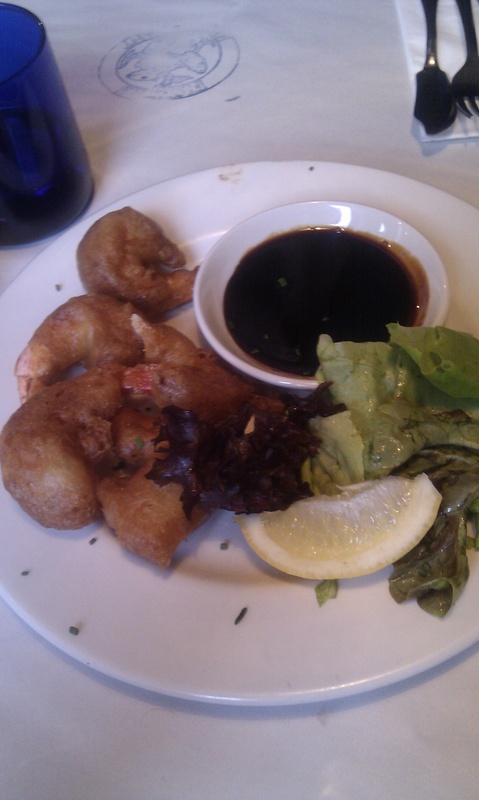 A friend and I shared a starter of battered tiger prawns with a soy dipping sauce. £6.95. Crispy thick batter around sizeable chunky prawns made the portion of five seem just right for two. The soy dipping sauce was thick and had a hint of ginger. Bread. Nice white bread, tasted even better when dipped into the soy dipping sauce. 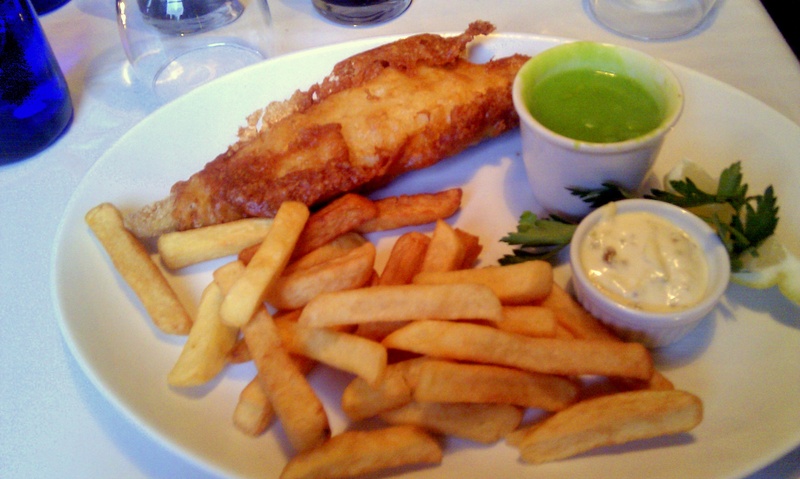 I had the beer battered haddock with chips, mushy peas and gherkin for my main course. £10.50. The reference to the gherkin is misleading, by the way. They forgot to mention that it would be found within the tartare sauce. The sauce, with the specially referenced gherkin, was enjoyable, light and tangy. It was a large portion of fish and chips. Bright green mushy peas were silky and lumpy and most fun. I think the chips were triple cooked for they were similar to the ones at Graze. Not crispy or soggy. That’s about it for my dining choices and they were all very nice. The part that I’ve left for last however is something that I didn’t try but appeared to be the most wonderful thing that could be found on any menu. 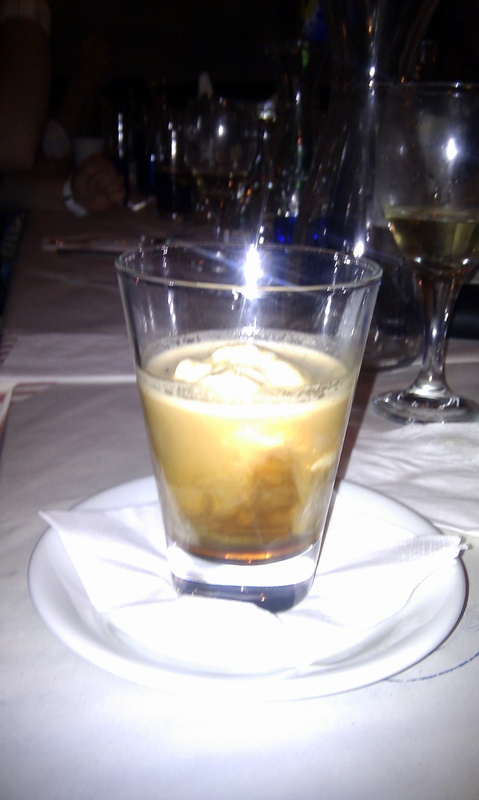 The dessert chosen by the person next to me was the Vaspretto, a scoop of organic vanilla ice cream, a shot of amaratto and a shot of espresso. In other places this is called an affogato, “drowned”, and at Flinty Red it was served with Calvados and vanilla ice cream, or PX and Maple and Walnut ice cream. £7 for either. At Fishers the dessert cost £4.65 and there was only one option of ice cream. I’m not sure why the name is different. I’ve only been able to find it referred to Vaspretto at the Fishers restaurants and while it looked amazing I didn’t try it. I’m not sure which restaurant I’d prefer to visit for the dessert but it will probably be Flinty Red. 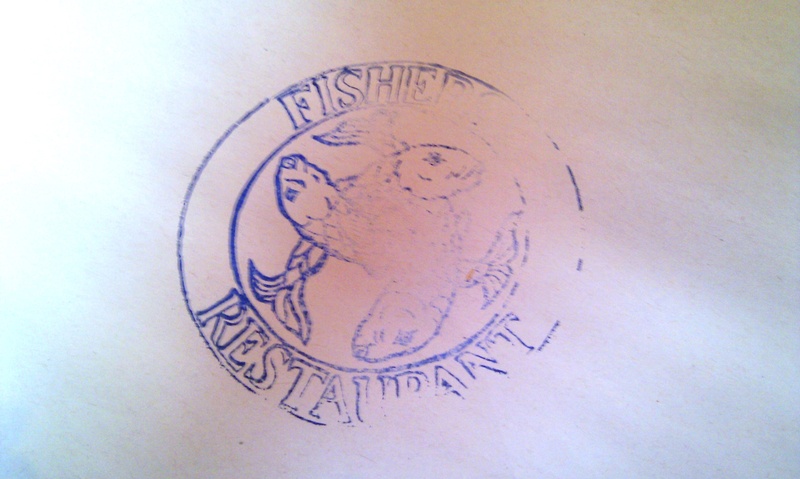 Fishers was very nice and enjoyable but I wasn’t exactly blown away. It’s a place I would take family rather than a date and it’s pretty specific about its menu choices. The seafood theme is not misleading at all. The service was great and surprising at the same time. Prompt delivery of food was completed with one member of our party not receiving his main for an additional seven minutes. His sole had been forgotten. Our waiter put up with our loud chatter, and delays in ordering, beautifully. However, just a few minutes later he was loudly taken to task for delivering a glass of wine five minutes late. I’m inclined to believe that the gentleman diner was at fault, but even though our entire table went instantly silent, we didn’t hear much more. A very pleasant evening for the celebration of lovely friends but it was no Rockfish or LFR. The choice was just right and casual enough for us to be left undisturbed even after everyone else in the restaurant had left. That was at 10.30 and as we walked past the still half-full Zizzi it felt a little early for the staff to be sweeping up. A good time for me to head home though while the rest went to the pub. It worked well. This entry was posted in Bristol, Food, Restaurants and tagged Bristol, Bristol restaurants, Clifton, Fishers, Food, review. Bookmark the permalink. I see they’re doing a £5 early dining offer – might give that a crack (possibly even worth breaking my embargo on anything involving Clifton). Good point and good reminder – the £5 meal deal was much discussed at the table. A selection of four mains that cost £5 each if ordered between 6pm and 6.45 and as long as you leave by 7.30. I was with a group of Greeks and we were struggling to see how you could eat that quickly. It’s also available every day of the week.